Actually there are several things you must do in order to give yourself the best chance at constructing a perfectly level and square cabin. And it all starts with the foundation. BUILDERS-TIP: We cannot emphasize how critical the foundation is. Taking the time here will save you heartache days, months and years down the road. #1 Make sure it’s level and square all the way around BEFORE you do ANY framing! 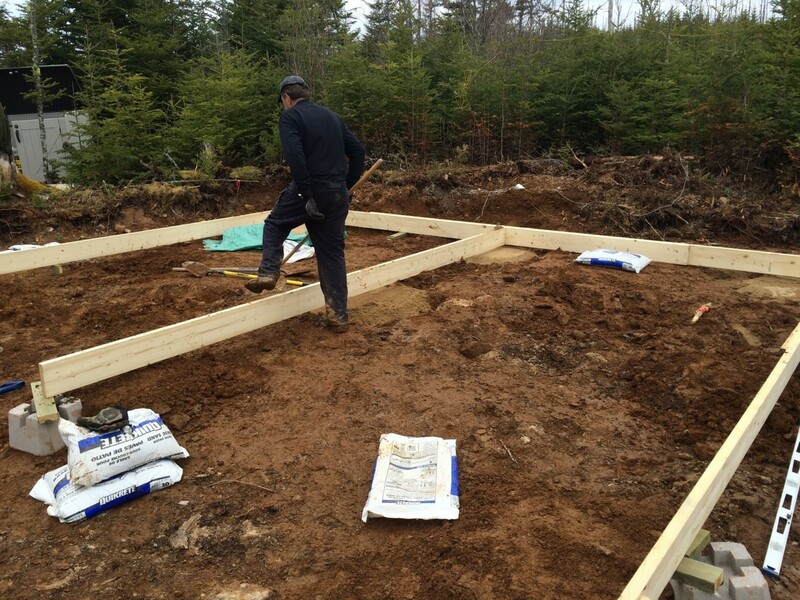 The fact is… if the foundation of your cabin/home is out as much as 1/8th of an inch at the bottom, by the time you get to the top of a framed wall that slight error will compound ten fold. The end result may be that the top of your framed walls may never line up. No matter how hard you pound on them with a sledge hammer, tug on them with ratchet straps or pry on them with a crowbar. I’ve seen it all. Why is the alignment of these walls (which stem from your foundation) so critical? Depending on the truss construction you may very well be exurting tens of thousands of pounds of pressure OUTWARD on those walls and if that load bearing wall is anything other than plumb you risk a catastrophic failure of your entire build. usually AFTER you’ve finished building it as that’s when the most weight, stress and weather affects your build. Also, skewed construction means windows, doors, flooring, cabinets, and drywall almost never line up properly. We’ll teach you every trick we know as we build our cabin to help you prevent this from happening. Everything must begin with a perfectly square and level foundation and stay that way until the last nail/screw is driven into the roof. 1. The first secret in building a proper foundation is choose the right ground. Make sure your building on undisturbed soil (earth). Know ahead of time what type of ground your working with (i.e. clay, sand, gravel, rocks, boulders, soil etc.) Also know if there is the potential for any standing water/freezing. Ensure you also have clearance around the building to work is your in a forested area like us. Remember, putting an exterior finish on your cabin requires more elbow room that the foot print your foundation will take. 2. Never rush this phase of the build. Take twice as much time as you think you need. When building the foundation remember that this is NOT where to cut corners. The more time you take to ensure your foundation is rock solid, plumb and level the less time the rest of the build will take. Taking your time now will speed up the rest of the build and that means you enjoying your cabin sooner rather than later. 3. Measure everything 3Xs at several stages of this phase. Even after you’ve got every pad, block, post, beam, or joist in place… check it all again. For plumb, square and level. I know your excited to see those walls go up. And I know the foundation isn’t where you see the biggest results for a hard days work but it is where you’ll get the best return for time well spent. 4. Use the right tools for the job (we share them below) and know how to use them properly to save time, money and frustration. 5. Lastly, don’t be afraid to adapt to the situation. Planning is essential but sticking to the plan isn’t always an option. Sometimes the type of foundation you initially settle on may not be feasible for your type of ground. Adapt and over come but remember to take you time. Here’s how our second day of building at the off grid cabin went. Here you can see the excavator clearing the top layer of organic matter. We’ve already cut away most of the brush by hand around this 60ft X 40ft area. 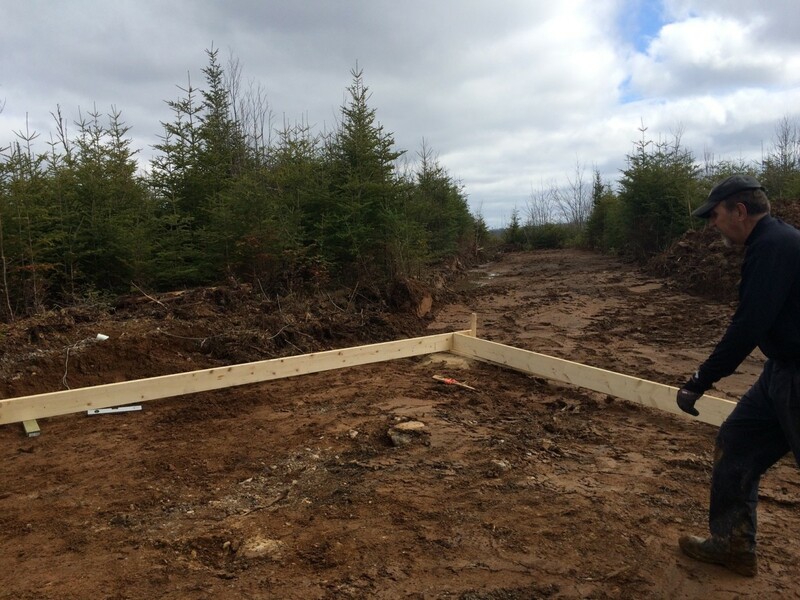 Here is the cleared area for where the cabin will be built. Yesterday the materials that we purchased (from Home Depot) were dropped off. While we brought a lot of the material down using our ATV, and a small but handy folding trailer, thankfully the excavator operator operator who was roughing in our access road was able to sling down the 3 concrete footings, 36 bags of crusher dust (2,376lbs in total) as well as the majority of the wood. Home Depot did however slightly dropped the ball on us and forgot to deliver the steel roof (which they had sitting on the top shelf of the store for the past few weeks after it was purchased though them and delivered from Ontario), and they also forgot 36 additional 8″ cinder blocks and the 12 24″ X 24″ concrete pads. And did however deliver us 10 1/2″ 4ft X 8ft OSB instead of 10 3/4″ T&G OSB and a lot of the lumber is actually longer than we ordered which is fine with us. Finally they delivered us 3 extra 10ft 6″ X 6″ pressure treated posts. SCORE! BUILDERS-TIP: Often times if the length of lumber you ordered isn’t available the store may provide you with longer (never shorter) lumber for for the same price as your quote. They want your business and will often take a hit on the cost of lumber in order to keep you happy and keep your business. Getting this part right is paramount. We discovered after peeling back the top layer of organic material that the underlying material was stone, very compact dirt and solid grey clay. Probably the best case scenario for the type of area we’re in (close to the water). The excavator was able to level the ground out incredibly well for us and that meant minimal manual leveling for us. Deciding where to build. This was all about the orientation of the cabin to the lake and sun. Luckily both are perfectly in-line and it was only a matter of rotating the layout to suit our view. The Cabin will be 16ft deep (front to back) and 20ft wide with an additional 8ft deep deck. 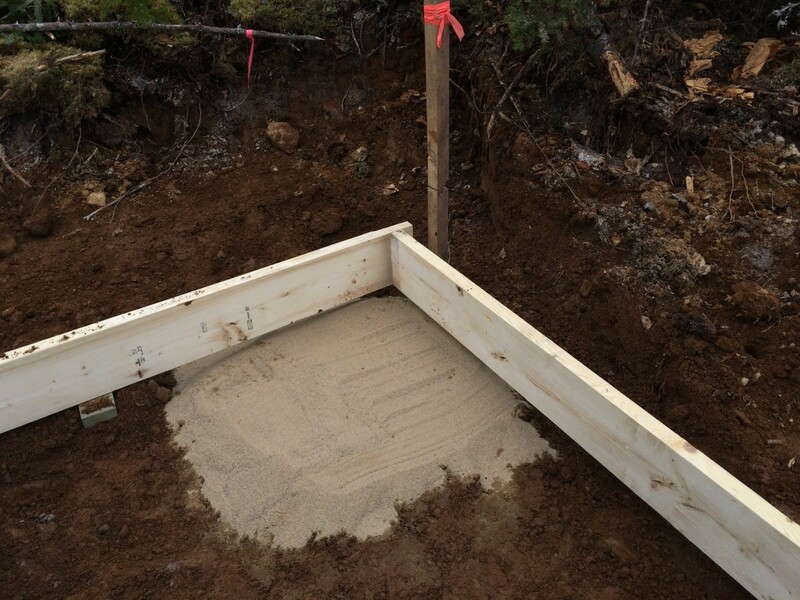 We put in simple wooden stakes to mark out the orientation of the cabin and then leveled out the ground with a shovel. We’ll be using 6 concrete pads with cinder blocks on top as the footing for the foundation beam to rest on. An invaluable tool we used to help us get the foundation perfectly level quickly was this super cheap string level. I highly recommend you pick one up! BUILDERS-TIP: When I share the tools we used I will always look online and find you not only the BEST price for the tool but also a HIGH QUALITY and AMAZON RECOMMENDED tool. I’m all about sharing the best of the best with you and even though this line level is LESS than $3… it’s Amazon’s top choice for line levels and ours as well! Another tool that sped up the building process ten fold every day was this small but mighty laser level. This is Amazon’s top choice for laser level and ours as well. We’ve used different laser levels during the build and this reigns king! This easily reaches from one end of the cabin build to the other even on the brightest days outside. That level survived being dropped from 30ft, being stepped on and dug out of the mud. It never failed. The battery never died. It’s just plain indestructible. We used these pieces of lumber and the level to “grade” the ground and finally level it all off with bags of crusher dust. We will be placing 24″ X 24″ concrete pads on this sand and then stacking cinder blocks on top of that. It might be less than $10 but this Stanley Powerlock 25ft Tape Rule (measuring tape) survived everything we threw at it. We ran it over with the excavator, dropped it from roof top onto the rocks, left it outside in the rain and even dug one out of the ground a year after we “thought” we’d lost it and I still use it today! Three 10ft 6″ X 6″ pressure treated posts will be supporting the roof over the front deck and that is why we have the three concrete post footings there. And for Day #2… that’s it. It took twice as much time to get the foundation leveled and squared but… it is probably the most critical point of the entire build. Next time, we’ll will finish up the foundation footings, build the support beams for the floor joists and start the floor joist. Be sure and SUBSCRIBE, LIKE and SHARE if you’ve enjoyed this post. Thank you for telling me about matching the latitude for the solar panels. I was just thinking of going out and looking at the sun. This will help a lot to have it panned ahead of time. Luckily for us, there are NO trees at all where we are building just lots of sage brush.